LITTLETON, Colo. (February 28, 2019) — Simpson Door Company featured Goldberg Brothers barn door hardware in their trade show booth at the 2019 International Builders Show, held Feb. 19-21 at the Las Vegas Convention Center. In its 75th year, the International Builders’ Show is the major yearly event of the National Association of Home Builders and is always scheduled concurrently with the NKBA’s Kitchen & Bath Industry Show. The combined event billed “Design & Construction Week” draws more than 80,000 building industry professionals from all over the world. Goldberg Brothers barn door hardware was awarded “Best Window and Door Product” at IBS in 2014. LITTLETON, Colo. (December 11, 2018) — As Goldberg Brothers marks the first anniversary of its relocation to the southwest Denver metro area this month, the 121-year-old company can look back on a year that brought many changes and innovations for the barn door hardware manufacturer. “The key to our success over the past year has been the renovation of our new building to best suit our manufacturing needs,” said Goldberg Brothers president John Golesh. “Our previous factory had been designed around our film reel products. We needed a facility more fully dedicated to making barn door hardware.” Golesh said this customization has resulted in greater operating efficiency, which has allowed the company to expand its product offerings. The cornerstone of the relocated factory is a state-of-the art powder coating line from Midwest Finishing Systems that allows for faster and more energy-efficient manufacturing. Since its installation, Goldberg Brothers has been able to increase the available colors of its barn door hardware products from 10 finishes to 16, including a pair of textured colors that the company offers at reduced prices. A second breakthrough this year was the introduction of Barn Door Edge Wrap, a do-it-yourself kit that allows anyone to custom-build a barn door from almost any kind of wood, such as shiplap or even reclaimed barn wood. The kit consists of a set of four steel channels that form a rectangular frame around the building material of choice. “Our Barn Door Edge Wrap system reduces the cost of a custom-made barn door to a fraction of what you would pay for a pre-built one,” said Golesh. “And it doesn’t require a lot of skill or tools to make a great-looking barn door in one afternoon,” he said. 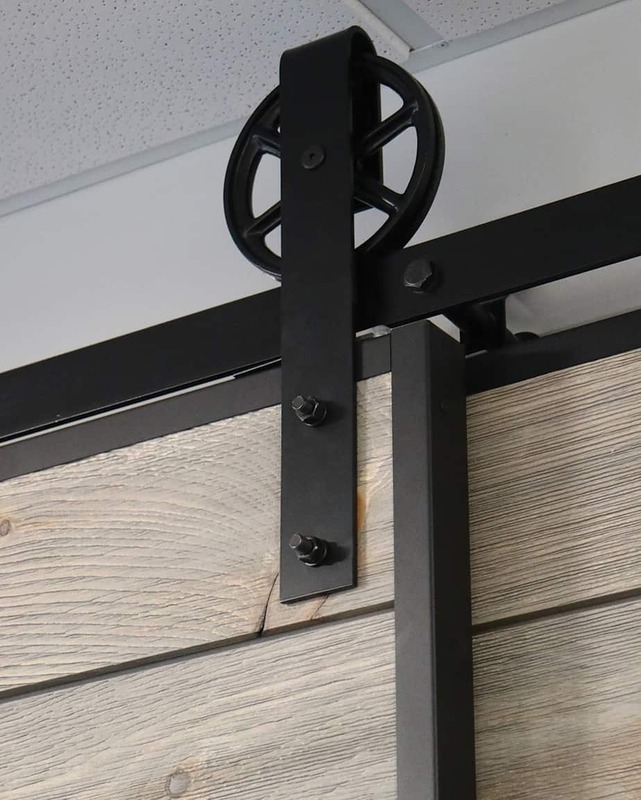 Goldberg Brothers has also expanded its barn door hardware offerings this year with the new Hidden Roller Series product line. This innovative design allows the rollers and track to be mounted behind the door instead of above it. The result is a clean, minimalist look with the roller hangers and half of the track hidden from view. Goldberg Brothers has also expanded its flagship Standard Series product line with two hardware sets featuring 6-inch diameter wagon wheel hangers for a more rustic, traditional look. Finally, Goldberg Brothers has been able to increase the availability of its MClad® cabinet facing products. The line of steel cabinet panel covers introduced on a limited basis last year can be used to rejuvenate the appearance of wooden cabinet doors and drawer faces in kitchens, workshops, and office buildings. Established in Denver, Colorado, in 1897 as a family-owned tinsmith shop, Goldberg Brothers is best known for manufacturing motion picture film reels and movie theater projection ports. The company began building steel barn door hardware for interior sliding doors in 2012. More than 20 employees work at its Reel Factory building in the Ken-Caryl Business Center in Littleton, Colorado. Further information and product photos are available at goldbergbrothers.com and goldbergbarntrack.com. 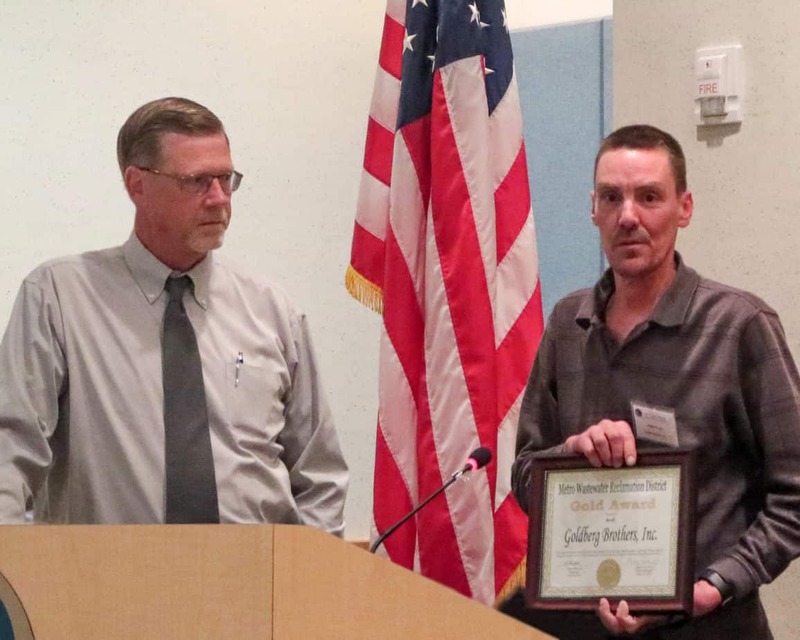 Goldberg Brothers maintenance manager John Ward (right) accepted a Gold Award presented by Metro Wastewater Reclamation District board chairman Daniel Mikesell at a ceremony held April 25, 2018. (Denver, Colorado, April 27, 2018) –The Metro Wastewater Reclamation District has awarded Goldberg Brothers, Inc. a Gold Award certificate for 100% compliance to wastewater pretreatment requirements in 2017, in a ceremony held on April 25, 2018 at the district’s administrative offices. Goldberg Brothers was one of seventeen industrial companies in the metropolitan Denver area to be honored at the annual event for their demonstrated commitment to environmental excellence. Goldberg Brothers maintenance manager John Ward, who accepted the award, said the company will continue to work toward 100% compliance in its new reclamation district now that the company has relocated outside of MWRD boundaries. All water used in the company’s manufacturing processes goes through a multi-stage filtration system to remove metal particles and to adjust the pH balance before being discharged into the municipal drainage system. “It is just good business to do our best to comply with environmental regulations,” said company president John Golesh. “We try to go beyond the minimum requirements, though. We use recycled steel in most of our barn door hardware components and other products. We have also equipped our new building with LED lighting, motion-sensing switches, and a new, energy-efficient powdercoating system.” The company also uses water-soluble lubricants in its stamping processes, recycles scrap metal, and has eliminated the use of solvent-based paints. The Metro Wastewater Reclamation District has presented fifteen Gold Awards to Goldberg Brothers since 1992. District officials also presented a Platinum Award to the company in 2003, for five consecutive years of 100% compliance.